It's been snowing since yesterday morning. 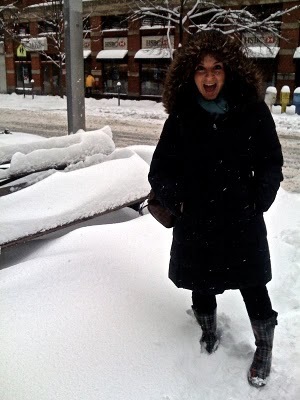 And when I say snowing, I really mean BLIZZARDING. I just new this morning would be a snow day. All my Brooklyn co-workers decided to work from home. Thats a good sign, right? Sweet boss lady tells me, "I'm leaving my house now! We might be the only 2 at work, but we'll see!" Ugh. If she's willing to traipse from her apartment, I guess I have to traipse from mine. These are little pictures roommate LA and I snapped amidst our struggle to work. 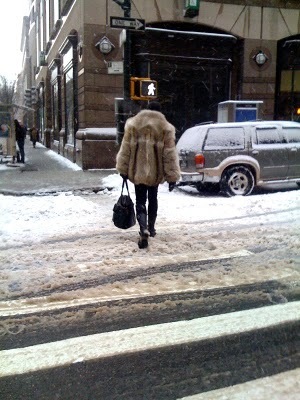 Please note the leather hand bag, the over sized fur coat and tight black leather pants. 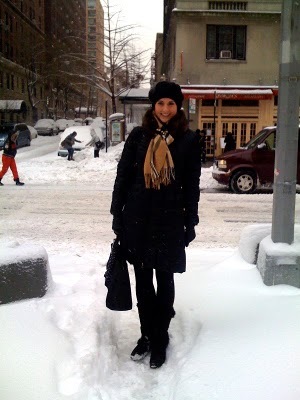 One would think this fashionista is a woman who doesn't take snow as an excuse to dress down. But now, this fashionista is a MAN who buys his snow wear in the form of pleather and faux fur. Strangely, I don't feel ridiculous anymore. The snow has made a valiant effort in trying to shut the city down. But I'll tell you this, 15 inches of snow and sleet and mess won't ever be able to shut the crazy down.